" A unique regional newspaper built on creative editorial that brings readers and advertisers together. " Welcome to the website of the Coventry Advertiser newspaper, contact us now to get booked in. A quality monthly newspaper that the public in your area can pick up for free. Small local businesses can advertise repeatedly at affordable prices. Do you have a website that is not working for you? Have you ever wondered why? We offer all our advertisers free website advertising whereby the public can view the paper online.Social media not your thing? Don't worry leave it to us. See our Facebook & Twitter pages! Whatever your advert may be we can design or redesign your advert absolutely free. Our newspaper brings you interesting editorials to appeal to both men and women. All our articles are written by local people who have the opportunity to write monthly columns ensuring local interest. The Advertiser is available at most newsagents, supermarkets such as ASDA, Tesco, Morrisons and Sainsburys and the local supermarkets Nisa, Londis, Costcutter and Co-op. The Advertiser is also available at most petrol stations, fish and chip shops, cafes and other outlets. Please email us a copy of your advert and the size you would like to place with us. Also let us know if you would like any changes to the advert. 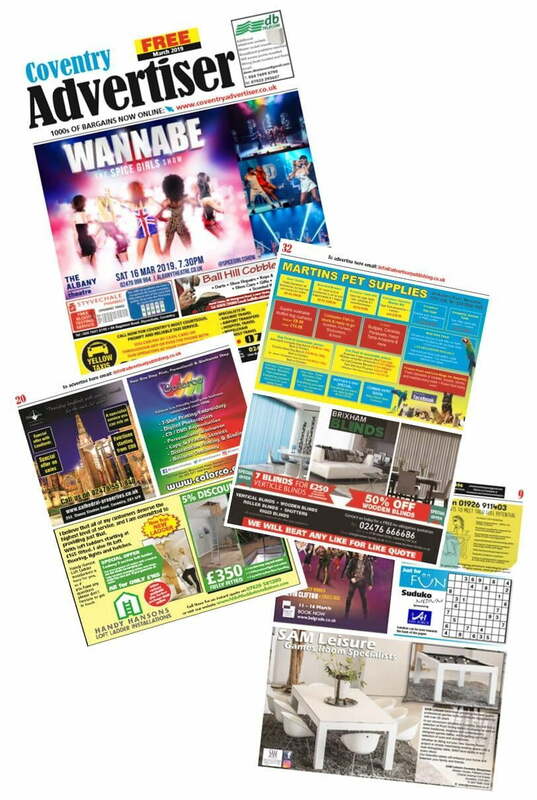 If you do not have an advert that we can use, please email or phone us, our design team will help you produce a stylish advert. Once your advert is produced we will email or provide you with a copy to ensure that you are happy with the advert before going to print. To find out more about the services we provide simply contact us.